"This delicious and unique smoothie will cool you off on those hot summer days!" Pour the apple juice into a plastic container and freeze until hard, about 2 hours. Remove from container and break into pieces. Place the frozen juice into the bowl of a blender along with the applesauce, yogurt, 1/4 cup of caramel topping, and peanut butter. 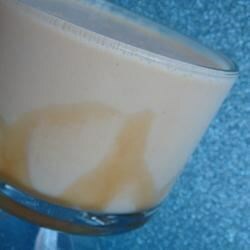 Puree until smooth, then pour into 3 glasses; swirl in the remaining tablespoon of caramel topping before serving. recipe looked good but the end result is a wierd mix of flavors. Me and my friends, made this together, but we didn't find it to appetizing.This recipe is not not one that I would not recommend to many people! i would substitute the apple juice and chunky apple sauce with fresh apples either cooked or uncooked then blended in a blender.